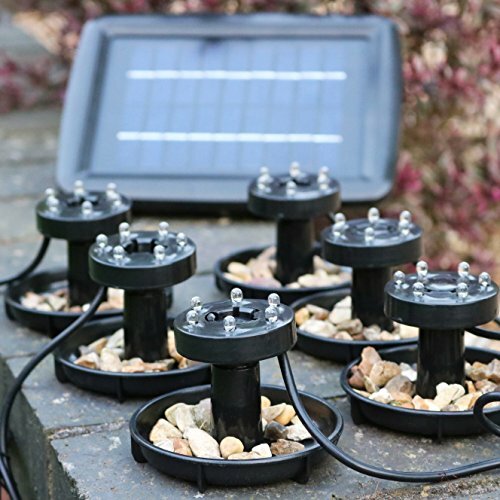 "Aquatica Plus UK ships 6 Submersible Solar Pond Lights – Underwater Waterproof Lights for Pool Lighting, Garden 2W by PK Green from Amazon.co.uk. Amazon.co.uk has fast shipping in the UK and often free shipping on pond and aquarium supplies. Add to your basket now while supplies last to avoid delays." Decorate your garden pond with bright underwater lighting. The set of 6 LED pond lights will brighten the depth of pond water, decorate fish tanks and add a fashionable light to pools and fountains. The 6 lights are connected on a series of cables which is attached to the power source of a 2W solar panel. The distance from panel to first light is 3.5m. Two lights can be separated by at least 2 -3 metres. The waterproof LED lights can be fully submerged underwater for a lovely night time effect. Add stones into the plastic case to weigh the lights down for secure fixture. Let your spotlights glow at night with the battery backup. The rechargeable batteries are located at the back of the panel and are easily replaceable.